Though large corporate companies may be able to offer fancy perks and a higher starting salary, a large number of graduates are opting to begin their career in a startup and feel that they will build more valuable experience in a smaller company. A startup can often offer graduates the freedom to have more flexibility and responsibility within the business; as due to the size of the company, it often means that employees have the opportunity to experience lots of different areas of the business. They may also have a lot more influence in the workplace, than if they were to take a junior role in a large global firm. So how exactly can a startup compete with bigger companies to win over the best talent? Universum have released their latest findings in their Talent Insights series, pin pointing what graduates want to gain from starting a startup and how employers can attract the top employees. What are the top career goals that graduates would like to achieve when joining a startup? Of the business and engineering graduates who want to join a startup, the top career priority among them is being entrepreneurial or creative/ innovative in a job (55% for business and 49% for engineering). In second place is work-life balance (50% for business and 48% for engineering), followed by job security/stability (35% for business and 33% for engineering). A previous survey found that graduates looking to join the tech industry rated being a technical or functional expert highly in their career goals; however those hoping to join a startup to not consider this particularly important. Those who are interested in working for a startup rate autonomy much higher than those seeking employment in the tech industry in general. What qualities do graduates look for in a startup employer? They also prioritise innovation and the attractiveness of an employers’ product/service lines when looking for a new job. Working for an inspirational manager is more important to them than market success . These individuals are keen to become leaders themselves one day and are confident in their leadership abilities (44% of business students consider leadership as their top priority). 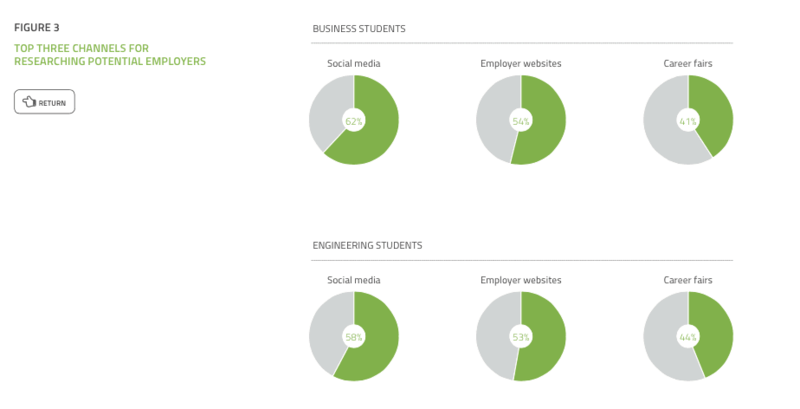 Business students rate future earnings as one of the most important elements of their career (42% ). Where can employers at startups find graduates? Companies should focus on social media, their company website and career fairs when on the hunt for fresh talent. Recruiters shouldn’t just focus on traditional social networks such as Facebook and LinkedIn, but also embrace alternative visual networks such as Instagram, Pinterest, YouTube or even Snapchat. Attempting to reach graduates via post or webinars is ineffective and recruiters are better off contacting graduates online. How can employers attract graduates? Create a happy combination of work-life balance and job security. Allow them to be entrepreneurial, creative and innovative. Do not punish them if at first they do not succeed. Emphasise the training programmes on offer and the opportunity for professional development within the company.